The NETGEAR Fast Ethernet Smart Switches offers comprehensive L2 feature set and enhanced performance and usability. They are purposely designed for small and medium-sized networks where reliability and performance are key and operational cost savings and ease of management are must-haves. 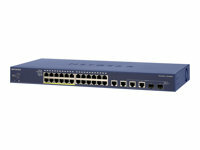 The NETGEAR ProSAFE Fast Ethernet PoE Smart Switch FS728TLP is a state-of-the-art, high-performance, IEEE-compliant network solution for users who require the flexibility of small form-factor pluggable (SFP) GBIC slots and the ease of Power over Ethernet (PoE). To simplify installation, the switch is shipped ready for use out of the box. The NETGEAR® Fast Ethernet Smart Switches offers comprehensive L2 feature set and enhanced performance and usability. They are purposely designed for small and medium-sized networks where reliability and performance are key and operational cost savings and ease of management are must-haves. Essential L2 network features ensure consistency in network setup and policy across the network, regardless of network speed. PoE Timer for scheduling on/off time of your PoE powered devices for better control and optimized use of your devices. NMS300, the NETGEAR Network Management System, consolidates the deployment and management of these switches along with all NETGEAR business products.